Railpictures.ca - John Pittman Photo: On the occasions when I’ve seen a GMD1, it has usually been in between other units. It was great to catch CN 1439 in the lead in 2018 on a nice autumn day in southern Ontario, and that the 5 locomotive set switching Aldershot Yard needed to pull cars this far west. Nearest are Oakville Sub main tracks 3, 2, and 1. CN 1439 is on the farther of 2 yard tracks, reducing to one ahead at Grindstone Creek. | Railpictures.ca – Canadian Railway Photography – photographie ferroviaire Canadienne. Caption: On the occasions when I've seen a GMD1, it has usually been in between other units. 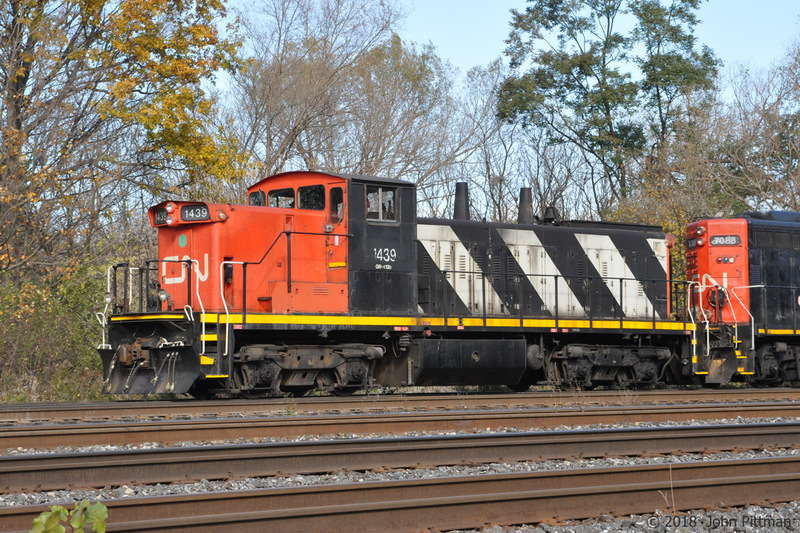 It was great to catch CN 1439 in the lead in 2018 on a nice autumn day in southern Ontario, and that the 5 locomotive set switching Aldershot Yard needed to pull cars this far west. Nearest are Oakville Sub main tracks 3, 2, and 1. CN 1439 is on the farther of 2 yard tracks, reducing to one ahead at Grindstone Creek.